A community group said it would like to support the owner of Hastings Pier but has called for more transparency between him and the community. 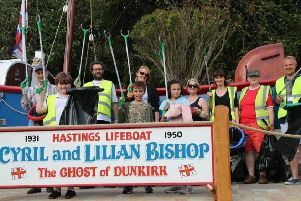 Friends of Hastings Pier, a community group which intended to buy the pier in the summer, made the comments after its application to have the landmark recognised as an asset of community value was accepted by the borough council. Owner Shiekh Abid Gulzar has not commented on the council’s decision. James Chang, from Friends of Hastings Pier, said: “We would like to be able to support Mr Gulzar in his role as current custodian of the pier. “Indeed, we are pleased to hear that Hastings Borough Council recognise the pier as an asset to the community which has also been echoed publicly in the past by Mr Gulzar. But we need more transparency between the owner and the community about maintenance and his vision for the pier’s future. Mr Chang said Friends of Hastings Pier was also concerned the ‘long-standing’ engineering and maintenance team was not currently present on the pier. Mr Gulzar said he was ‘unable to comment on matters of a confidential nature’. In response to concerns following Saturday’s fire on Hastings Pier, Mr Gulzar added: “I do not want to respond to wild rumours from anonymous sources. “I am happy to engage with the Hastings community at all times. “Indeed, I am already doing that on a daily basis.